THE HANDSOME BEDFORD STONE Beecher Mausoleum was formally designated a Will County Historic Landmark in 1998. Vandalism has damaged the once-pristine white marble interior, and the original Louis Comfort Tiffany-crafted stained glass windows are no longer there. But a new group of “guardian angels” are looking to restore the building. Monetary donations and volunteers to help clean and repair the interior are needed. 11-11-2012 Board Seeks Help Restoring 100-Year-Old Beecher MausoleumA century-old mausoleum in Beecher is about to get a new life, thanks to a handful of residents who recognize its place in the history of Eastern Will County. The Will County Historical Preservation Commission and the Will County Board officially designated the stately Bedford stone and white-marble building a Will County Historic Landmark on March 19, 1998. 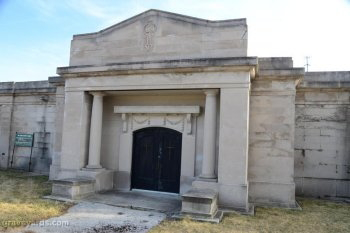 Researching the history of the Beecher Mausoleum, along with trying to learn about the lives of those entombed within it, is a fascinating project that can take history buffs back to the early part of the twentieth century when Beecher was bustling with new residents. Gould and Reed Streets then were little more than dirt roads filled with horse-drawn buggies. Passenger trains stopped at the Beecher depot every day to pick up passengers and deliver the mail. It is easy to get lost in those times and wonder what really happened when some village forefathers, such as Henry Thielman and Arthur Struve (Beecher’s banker), acted on the community’s vision to offer an alternative to in-ground graves that provided a clean, dry, dignified place in which to pay respects to loved ones who had passed on. Like many other communities in that era, they set out to build the strongest, most enduring structure of its time. Sadly, not all of the mausoleum’s history has been positive. In fact, in its more recent past, not only have there been incidents that have severely damaged the building itself, but scandalous rumors have demoralized the very story of the once-proud, reverent undertaking. Beecher historians are looking to put some of those rumors to rest. It has long been believed that the mausoleum was owned by a woman in Chicago Heights, who was a descendent of Arthur Struve. The long-held notion that the mausoleum was owned by Struve’s granddaughter, Peggy Orr, is untrue. The Beecher Mausoleum was initially governed by a board of directors in accordance with the 1903 Cemetery Care Act. On April 3, 1914, the original cemetery association elected the following officers and trustees to manage the building: Henry B. Ruge, Charles Beseke, Chris. B Eskilson, Charles Hack, Frank Hunte, Arthur Struve and Tom Fick. Four of the men served three-year terms and three served six-year terms. C.B. Eskilson was elected president, Charles Hack, vice president, and Frank Hunte, secretary-treasurer. Unfortunately, new members were never appointed to replace original members who passed away. The circumstances surrounding subsequent board members remains unclear. Arthur Struve’s daughter, Rosamunda Orr, repaired and maintained the mausoleum for decades, often utilizing craftsmen from Orr Construction, the family business. Rosamunda’s daughter, Peggy Orr, continued to take care of the building when her aging mother could no longer do it. Both Rosamunda and Peggy used their own money to make repairs and to pay for lawn maintenance. Peggy Orr’s personal letters from the 1980s document her frustration over caring for the building and repairing what vandals did without help from anyone and with no end in sight. She took care of the building out of the goodness of her heart and the sense of pride she inherited from her grandfather. She didn’t own the mausoleum, but she maintained it to the best of her ability for as long as she could. Ultimately, the task became too great for her. It was widely believed that Peggy Orr owned the mausoleum, but that wasn’t the case. One of the saddest chapters in the mausoleum’s history was caused by the damage both inside and outside of the building. Vandals broke into the building on several occasions over a 10-year period. Marble slabs that bore the names of the deceased were smashed. Small fires lit inside the building scorched and stained marble floors and ledges. The entire structure was littered with broken glass bottles and graffiti. The glass block windows, which had replaced the original stained-glass, were riddled with bullets and were broken time and time again. When the initial management of the mausoleum was established, funds from the sale of crypts were collected for care and maintenance of the building. Some of the other mausoleums built during the same time period by the same builder, Cecil Bryan, who is credited with building more than 80 mausoleums across the country, have funds remaining. Others do not. Some of the other mausoleums are in great shape. Others have been left to decay without care. It is unclear what happened to the money initially set aside for maintenance. It apparently ran out during the 1960s. Whether it was the result of investments lost when the stock market crashed in 1929, or simply was spent on costly repairs following the vandalism, remains unknown. It is noteworthy to add however, that there is a vast difference between the dollar value today and that of the early 1900s. Trying to predict the financial future by setting aside funds would likely fall far short at today’s high costs. For example, it is estimated that $500 in 1914 would have the buying power today of about $11,000. By today’s standards, that amount of cash would not go far. Despite the many colorful chapters in the mausoleum’s history, the fact remains that the building has stood for almost a century. Historians, and a new board of directors, feel there is no reason to believe it cannot stand for another century, given the proper care. The new board of the Beecher Mausoleum Guardian Angel Association, seated this summer, includes Sandra Lee Thielman, president; Washington Township Supervisor Bob Howard; Beecher Village President Paul Lohmann; John Dean, of Hack Funeral Home; Lance Saller, of Bahlman Oil; and Donald Bahlman, architect. “I believe the mausoleum can again make a positive impact on the community,” said Thielman. “We welcome participation by any other concerned or interested persons,” Thielman noted. Through the efforts of Sandra Thielman and Bob Howard, the Roofers Union/Local #11, the Carpenters Union/ Local #434 and the Bricklayers Union/Local 21 have all agree to do the necessary repair labor to replace the roof and the stone scuppers/drain spouts. With the assistance of the unions, the expense of the needed repair materials will be minimal. Thielman said it will be necessary to solicit donations from larger organizations, including philanthropic and fraternal organizations, along with community support such as fundraisers and raffles. “Washington Township and the Village of Beecher are not the only communities we will approach with our plea for support,” she added. “The Village of Crete has a strong connection to the mausoleum, since prominent citizens and veterans of other communities, including some in Indiana, rest eternally within the walls of the Beecher Mausoleum. “Beecher’s Mausoleum has survived for 100 years thanks to the love and care of two good souls and perhaps a handful of anonymous good samaritans,” said Thielman, a member of the Beecher Mausoleum Guardian Angel Association. “I have worked to restore the building’s dignity since 1996, when I saw it at its worst. “This structure is a time-line, a history book carved in marble, a family tree linked not just to those buried inside but to thousands of families directly and indirectly connected to it. It’s a building with a story that must be told, accurately and with dignity,” she added. When built, Beecher Mausoleum included 210 crypts total, 170 isle crypts and four family compartments of 10 crypts each. Isle crypts sold for $200-$300, family compartments were purchased for $1,500. In 2012, there are 29 isle crypts and 26 salable crypts. There also are 17 family compartment crypts unoccupied. Currently, 171 people are entombed in the Mausoleum, representing 65 family surnames.